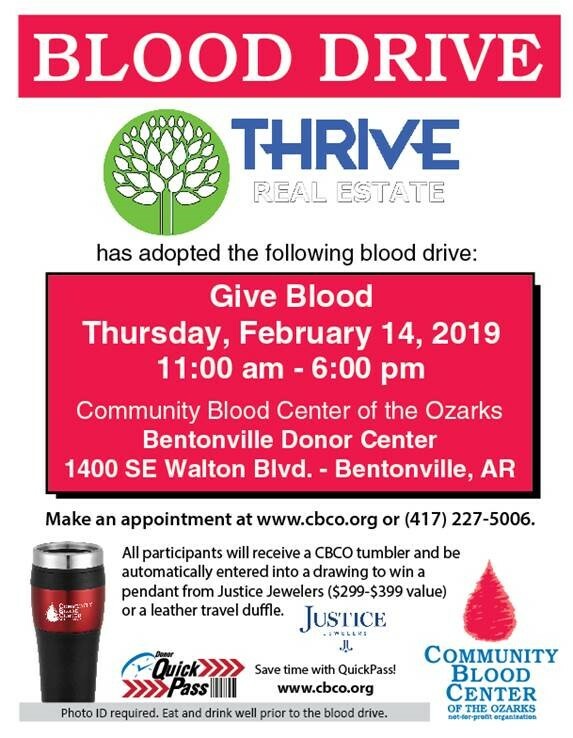 Thrive Real Estate has adopted a blood drive at CBCO’s Bentonville Donor Center! Join us from 11:00 a.m. to 6:00 p.m. Thursday, February 14, 2019, at 1400 SE Walton Blvd. in Bentonville, Arkansas. All participants will receive an insulated CBCO tumbler, and your names will go into a drawing for a pendant from Justice Jewelers ($299 – $399 value) or a leather duffle. Make your appointment by clicking HERE and then choosing February 14. Talk it up by visiting Thrive’s Facebook group for the blood drive by clicking HERE.